Outcomes management isn't just the latest buzz term floating around. The landscape has been changing for the social services sector, and organizations are increasingly expected to deliver identifiable, measurable results. "Doing good" is no longer enough; organizations need to justify costs by demonstrating program value. They need to show that their programs are achieving meaningful outcomes that are aligned with larger policy priorities. Outcomes management is the process of analyzing output numbers to gain a better understanding of what they mean, what's being achieved, and where changes can be made for improvement. Effective outcomes management involves taking a closer look at the services being provided and what the client population is gaining from those services. For the vast majority of organizations, even smaller ones, this task requires a modern and robust software solution that can support the process, helping the organization to meet its reporting and accountability requirements. It's true that some aspects of the outcomes management process are nontechnical, such as program planning and decision-making. However, the entire process rests squarely on having comprehensive, up-to-date, accessible program data. The data need to be there, and they need to be in a format that can be easily manipulated and analyzed. This is where the need for an adequate software solution comes into play by providing tools to support the process of data collection, data manipulation, and data analysis. McKenzie Smith, LCSW, has more than a decade of experience working in child welfare as well as children's behavioral and mental health. She is also the founder of INorupt, a centralized hub that provides the social services sector with a wide range of resources to help them select and manage technology effectively. Smith has witnessed the shift towards outcomes management. Funders and policy-makers are steadily raising the bar as they call for program activities and outputs to be analyzed in a meaningful way. "Across the board," Smith says, "federally, state governments, and even some foundations are starting to expect this." Organizations must be able to justify their programs and funding by demonstrating the quality of their services via outcome achievement. It's difficult to do this while relying on overly simplistic or outdated tools. Such tools limit the organization's ability to get a comprehensive, in-depth look at what's going on over time with the client population being served. Smith recalls how years ago, many organizations relied on Excel spreadsheets for basic data collection. Or, perhaps the organization had a relatively simple database (e.g., Microsoft Access) for storing client names and demographic information. "Previously," she says, "we were collecting some information, but we could never do anything with it." The ability to collect extensive information, and the capacity to actually work with the information being collected, is critical. This is how the organization gains a better understanding of what's currently taking place with regard to targeted outcomes. Without this knowledge, it's difficult to make informed decisions about the steps that need to be taken to manage and influence those outcomes. Today's software solutions collect more than just routine demographic details about clients. Modern systems collect extensive data that provide greater insight into client needs and how well the organization is meeting those needs. For instance, a growing number of software solutions collect details about client referral sources, waiting lists and wait times, length of enrollment in programs, enrollment in multiple programs simultaneously, and repeat enrollments over time. Detailed discharge information is also standard in many of today's software tools, and plays a huge role in understanding how well outcomes are being achieved. Is the client being discharged from the program because the program cycle was successfully completed? Or, did the client choose to withdraw prior to completion? Was it a case where the client no longer required support services? Or, if the client was in need of alternative services, was the program able to facilitate an outbound referral for the client? Was the initial program able to confirm that the client did indeed get successfully linked up with the new program or appropriate resources? This type of information is critical to understanding client needs and how well a program is meeting those needs. What types of patterns emerge when the information is aggregated across all demographic groups? What patterns emerge when looking at this information over the past year? The past five years? Do the data show any emerging trends that the program may need to adapt to? This is the type of data analysis that gets to the heart of outcomes management. When the software system supports this type of data collection, manipulation, and analysis, program managers can better assess the effectiveness of their programs. They can show quantitatively how they're achieving desired program outcomes. They can also identify exactly where changes are needed in order to meet the needs of clients more effectively. Initially, it was acceptable for organizations to describe their work in qualitative terms, perhaps providing a few statistics regarding the number of clients served. Later, there was increased emphasis on data collection and more detailed reporting. Now, as the practice of outcomes management spreads and takes hold throughout the social services sector, organizations are facing the need to adapt once again. They need to build their technical capacity so they can quantify the impact their services are having, allowing them to demonstrate the type of quality and outcome achievements their funders are looking for. The need to increase their technical capacity presents a challenge to many organizations. They wrestle with the notion of diverting extensive time and resources towards technology, when their ultimate priority is supposed to be service delivery and client care. Smith believes it's important for organizations to view technical capacity not as a diversion from more important priorities, but as an integral part of the organization's big picture. Noting the tendency of the social service sector to be very risk averse, she explains that it's important for organizations to recognize that the time and resources invested in building their technical capacity up front will make their programs more efficient and effective in the long run. She sees this as an area where the social service sector on a whole needs to start "working smarter" and "functioning more like a business rather than a charity," by factoring in return on investment as part of their planning and decision-making. It's true that researching and purchasing software is time-consuming and costly, not to mention the time and costs associated with training staff to ensure that they're using the system correctly once it's deployed. But the pay-offs become abundantly clear in the long term, when both time and money are saved due to all the efficiencies gained. "Social workers are often working in emergency or crisis situations," she says. "But everything is always going to be a crisis if we don't find new ways, both technologically and operationally, of doing things." While advances in technology have allowed software solutions to evolve and become more sophisticated, all isn't perfect. Program needs and workflows differ greatly between organizations. Some organizations are able to find a software solution that closely reflects their program's workflow and activities; others find themselves settling for a software solution that's good enough but not ideal, much to the frustration of staff who use the system. As the reporting and accountability demands on organizations intensify, there will be an even greater demand for intuitive software solutions that truly fit the organization and support its activities. In view of this, it makes sense to have increased collaboration between social services and the information technology sector. Smith notes that the two sectors have been coming together more in recent years, something she wholeheartedly supports. She has found that social workers often have great ideas for how software tools could better meet their needs but lack the appropriate channels or platform for acting on those ideas and bringing them to fruition. Connecting the two sectors is a logical step. With input from the social services sector, information technology developers can build tools and solutions that better meet program needs, and are better adapted to support the growing accountability demands being placed on organizations. 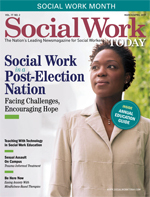 Smith understands that the technical aspects of outcomes management may present some challenges for social workers, who typically aren't coming from a technical background. "So often," she says, "we as social workers feel that we don't know about technology, and we don't want to get into it. But it increases your reach and the amount of tools you have to work with as you deal with people." Smith encourages social workers to be open to the benefits of allowing program management software and other technologies to play a larger role within the organization. She points out that in many cases, the right tools can work to support social work goals. "It [technology] increases the efficiency and effectiveness of what social work practice is," she says. "It serves as a tool we can leverage to increase the good we do in the world."